Growing up in the bicycle business, charming old bikes are ingrained in my soul. Our collection of bicycle pillows, clocks and decor accents is continually growing as we find new products which we know you'll love! 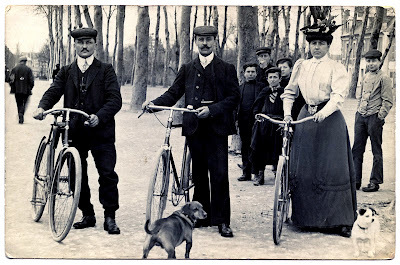 Isn't this vintage bicycle photo fabulous? Thanks to The Graphics Fairy for recently sharing with us. If you're a bicycle lover too, then take a peek at our Charming Bikes board on Pinterest. I so love to see a bicycle with a basket; so charming! I hope you will Come and enter my amazing Cross Bottle Guy Giveaway!You will love it! May sea inspired designed!